There’s no question Sir Andrew Lloyd Webber’s incredible contribution to the world of musicals. He received a knighthood from Queen Elizabeth II and a peerage in 1992, and his list of Tonys, Grammys, an Academy Award, Novella Awards, Olivier Awards, a Golden Globe, etc. is endless and impressive. Lloyd Webber’s musicals read like a “who’s who” of musical classics: Joseph and the Amazing Technicolor Dreamcoat, Jesus Christ Superstar, Evita, Cats, The Phantom of the Opera, Sounset Boulevard, The Wizard of Oz, and School of Rock, to name a few. Many have enjoyed extended runs in London’s West End and on Broadway in New York City. When Evita was being made into a film in the mid-90’s, the process of casting Eva Peron took on the same epic proportions as trying to find the perfect Scarlett O’Hara some fifty years prior for Gone with the Wind. While Vivien Leigh is now considered to be the perfect choice, not everyone thought Madonna was capable of portraying Eva Peron, and to this day there’s still no consensus on it. Madonna lobbied hard for the part, writing long letters pleading her case, and showing up to meetings and auditions in 1940’s style costume, and she readily agreed to vocal training as Lloyd Webber was concerned about her ability to sing in a musical. Antonio Banderas, originally cast as Che Guevara, remained in the project, and Jonathan Pryce was cast as Juan Peron. Madonna, whom is often associated with being a bold, confident figure in pop music, revealed a refreshingly vulnerable side, admitting she was used to having complete creative control as a pop singer, and not used to the process of recording her voice solo with other music parts added on later in production. She admitted to feeling “petrified”, saying “I had to sing ‘Don’t Cry For Me Argentina’ in front of Andrew Lloyd Webber … I was a complete mess and was sobbing afterward. I thought I had done a terrible job.” She won a Golden Globe for “Best Actress – Motion Picture Musical or Comedy” in 1997, and the song “You Must Love Me”, sung by Madonna, won “Best Original Song” at the Academy Awards. 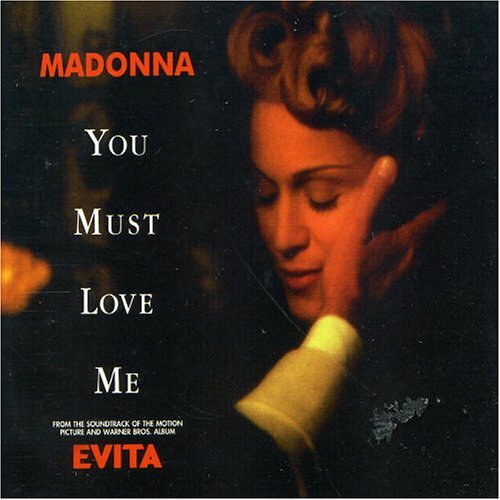 Madonna sings the “You Must Love Me” from Evita. Sir Andrew Lloyd Webber was born March 22, 1948 in London, England, and still resides there.